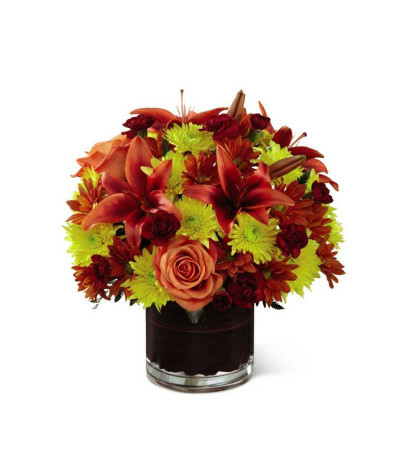 The FTD® Natural Elegance™ Bouquet exudes the warm comforts and essence of the autumn months with its rich and vibrant colors. 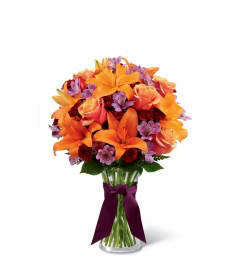 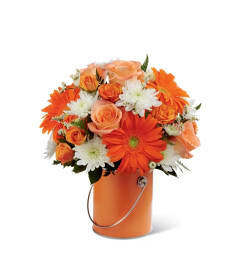 Rust Asiatic lilies, orange roses, bronze traditional daisies, yellow chrysanthemums, burgundy mini carnations and lush greens are perfectly arranged to create a simply stunning fresh flower bouquet. Presented in a clear glass cylinder vase lined with red ti leaves to create an elegant finished effect, this flower arrangement makes an excellent way to share in the fun of your special recipient's Thanksgiving get-together, fall birthday, or can be sent to express your thanks or get well wishes.